Are you interested in using argument-driven inquiry for middle and high school lab instruction but just aren’t sure how to do it? Argument-Driven Inquiry in Earth and Space Science is a one-stop source of expertise, advice, and investigations to help Earth and space science students work the way scientists do. The book includes a well-organized series of 23 field-tested labs that cover a variety of topics such as Earth’s place in the universe, the history of Earth, Earth’s systems, weather and climate, and Earth and human activity. You can use the introduction labs to acquaint students with new content or the application labs for deeper exploration of the use of a theory, law, or unifying concept. The labs will also help your students learn the science and engineering practices, disciplinary core ideas, and crosscutting concepts found in the Next Generation Science Standards and develop the disciplinary skills outlined in the Common Core State Standards. 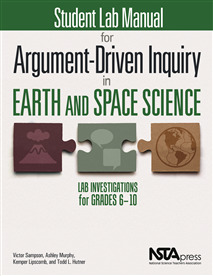 Student Lab Manual for Argument-Driven Inquiry in Earth and Space Science provides the student materials you need to guide your students through these investigations. With lab details, safety information, and handouts, your students will be ready to start investigating.